Concept Feedback is one very useful and simple tool for designers and developers to get feedback on their designs and concepts. Whether you’re working on a brand new web project or redesigning your own site, getting feedback before you launch can prove very, very useful. We’ve partnered with Concept Feedback to give away premium concepts to 5 readers of SpyreStudios. 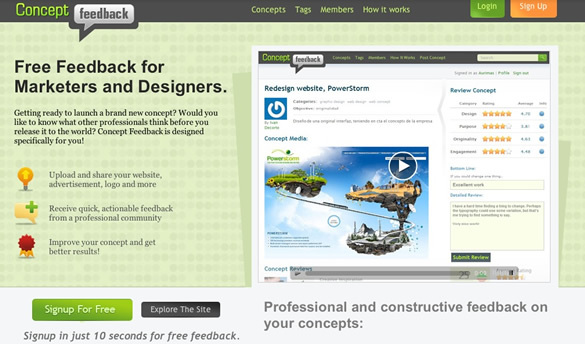 Posting concepts on Concept Feedback is free, but a premium concept goes live right away and is featured on the Concept Feedback homepage for a full week. You then get more exposure and reviews from users (they will even personally invite their top members to review your concept). This normally costs $9.99 but you can get one for free by entering this contest. To enter the contest, simply tell us why you’d like to win. You can do so by leaving a comment on this post or via Twitter (with the hashtag #SpyreConcept). You can also send me a RT @jophillips with your answer. Are you currently working on a design you could use some feedback on? Are you stuck on redesigning your site and could use some input? Well, here’s your chance to win a premium concept and get great feedback on your project. This contest will end on Friday, January 15th, 2010 at midnight EST. We will use random.org to pick the 5 winners and the winner will be announced shortly after. This is a great idea, how many times have you sat facing a new design only to wish you had someone to rate and gauge how good it is! Excellent, thanks for sharing this. I have not get any “give away” ever. I read your blog almost everyday. If you want you can give me. Im just starting out and as a newbie I could use the guidance! Hell- forget newbie- constructive criticism and feeback is good at any stage in your development! Thanks for the opportunity for a chance to win this nifty little service! I think I should win because I like chicken. b/c a great concept can take you places and make help my creativity grow. I need that edge! I think I should win this giveaway ! I recently discovered Concept Feedback and really love it. I have only used the premium option once, it was a huge difference to the free feedback. Right now I’m working on designing my portfolio (the hardest project ever!) and could really use a lot of feedback. It would be great to have a premium feedback handy. Great blog by the way! Pls enter me in the contest for this useful giveaway. I’d love to try this out and get some useful feedback on my designs! I think getting feedback is one of the best ways to becoming better and better in webdesign Usability and UX.Concept Feedback is a nice, nifty tool to achive such feedbak. I really want to win this contest conz i am redesigning blog with a now look. Hope I WIN Fingers Are Cross. Hi Guys at Spyrestudios an ConceptFeedback. I wanna say thanks for this nice little gift. The first time ever i won something. Greetz from germany. Because I’m in the process of redesigning my portfolio and I really need some feedback on this.